Ex-NYPD cop Filomena Buscarsela–the irrepressible urban crime fighter of 23 Shades of Black and Soft Money–is back. This time, the tough-talking, street-smart Latina heroine sets her sights on seemingly idyllic suburbia, where an endless sea of green lawns hides a toxic trail of money… and murder. But something is rotten on Long Island. When Filomena discovers that a high-tech Long Island factory is spewing poisons into the water supply, she’s sure that the contaminator is none other than her nemesis, a cutthroat industrial polluter with an airtight financial empire. Armed only with an ax to grind, the gutsy Filomena knows she’ll have to play dirty to clean up the neighborhood, with the help of an “underground” network of supportive women. 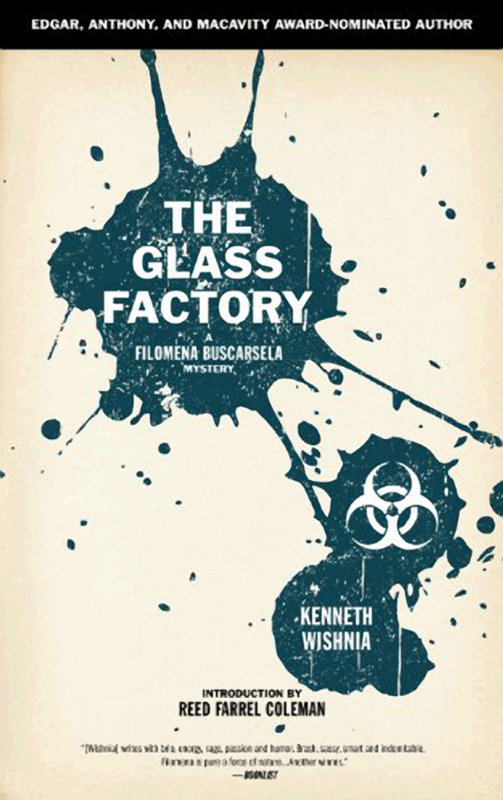 Editor’s Note: An action-packed and furiously entertaining hardboiled mystery, The Glass Factory showcases the sharp wit and distinctive narrative style that have made Kenneth Wishnia one of the most promising new voices in contemporary crime fiction.